Once you complete the site creation process, you can begin customizing your site. 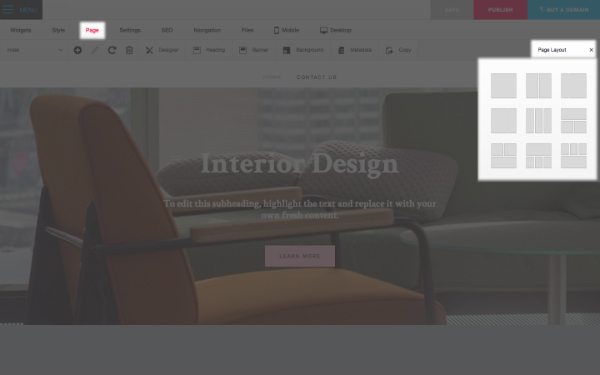 We have given you a head start with a template a basic layout with Text and Picture widgets, some content to help you get started and your business address (if you opted to add that) - all of which you can begin editing right away. First off, you can change the layout of your page by clicking Page > Page Layout. Selecting a layout will make it much easier to control the exact position of your content and will make your page look more attractive. 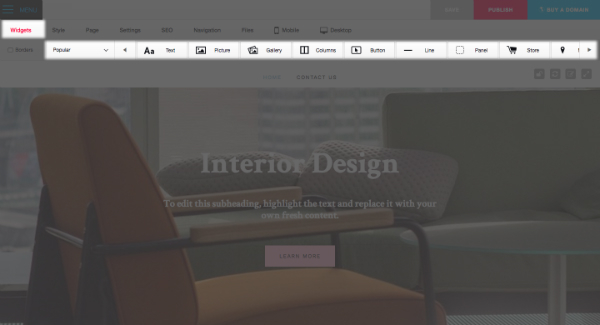 In the Sitebuilder, you drag widgets (components) from the Widgets menu to start filling your page with text, pictures, video, and much more. Each type of content has its own widget. To add a widget to your page, click on the icon and hold the mouse button down. Move your mouse pointer over onto your page. When you see the blue box outline appear, release your mouse button and the widget will be inserted into your page. If you are having difficulty with this, you can also double-click on any of the icons and the widget will automatically be added at the bottom of your page. Text: Before you can start typing on your page you need to drag and drop a Text widget onto the page. This will create a text box for you to start typing in. Go to Widgets and select Popular from the drop-down menu. Drag and drop the icon marked "Text" onto your page, or double-click on it. Once you have dropped this widget onto your page, simply click inside the box and start typing. Please note: Whenever you have a Text widget selected on your page, you will see a Text Editing Toolbar along the top of your screen that allows you to format your text. This toolbar is only present when you need it, so don't worry if it suddenly "disappears" - this just means that you have a different item selected. Click on the Text widget and the toolbar will come right back! Pictures: You will probably want to add pictures from your own computer to your website at some stage. One quick and easy way to do this is with the Picture widget. Go to Widgets and select Popular from the drop-down menu. Drag and drop the the icon marked "Picture" onto your page and you will be taken through the steps of adding a picture.